U-ki-yo-e is a Japanese wood-block prints from the 17th and 20th century (from Edo to Meiji era in Japan). You may have seen well-known print of Red Mt. Fuji by an ukiyoe legend “Ka-tsu-shi-ka Ho-ku-sa-i”. 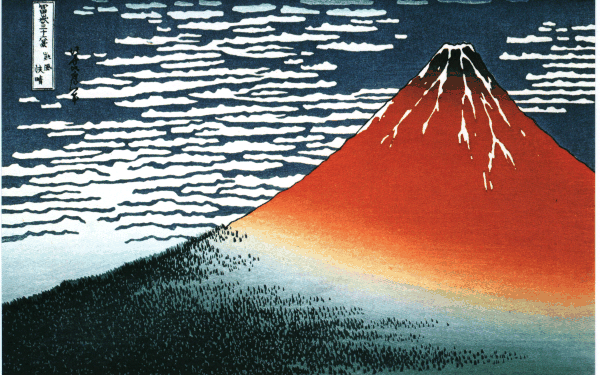 Photo: Artist: Hokusai Katsushika / Title : Ga-i-fu-Ka-i-se-i (better known as Red Mt. Fuji) / Print was created between 1831 – 1833. Ohta Memorial Museum of Art is a very small museum, but has some of remarkable collections of U-ki-yo-e masterpieces in intact condition. If you like to experience the “floating world”, I highly recommend you to visit Ohta Memorial Museum of Art in Harajuku.